HABIT: Fibrous-rooted shrubs with spectacular spring colors of red, white, pink, lavender, and all sorts of combinations. Some varieties have attractive evergreen foliage; others are deciduous. Indica azaleas such as ‘Fielder’s White’ and ‘Pride of Mobile’ can take more sun and are more open growing. Kurume azaleas such as ‘Hino Crimson,’ ‘Snow,’ and ‘Coral Bells’ are tighter growing and need more shade. Gumpos are dwarf and bloom later than all other azaleas. Huge numbers of species, varieties, and cultivars are native to various parts of the world. CULTURE: Must be grown in special beds of mostly organic material – build a raised bed of 50% quality compost and 50% cedar flakes that have been at least partially de-oiled. Per cubic yard of mix add 1 gallon of Texas greensand, 1 gallon of whole ground cornmeal and 5 gallons of lava sand. Moisten the mixture thoroughly before installing the plants. Others recommend a mix of peat moss and pine bark, but we don't. Be sure to loosen the pot-bound roots and soak the roots in water with Garrett Juice prior to planting. USES: Evergreen hedge or mass, spring color. PROBLEMS: Summer heat, chlorosis, poor drainage, scale, and spider mites. ANSWER: In an organic program, we fertilize all plants basically at the same time because we are feeding the soil, not force-feeding the plants. And that should make your life easier. The normal times to fertilize in my Basic Organic Program are late winter, early summer (June) and fall (October). 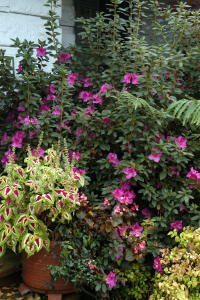 Azaleas need a different kind of maintenance than more adapted plants in North Texas. Not only is organic fertilization needed, but the basic organic matter of the beds need to be replenished on a yearly basis. Some azalea growers recommend to “topdress” azalea beds with a mixture of one-half brown Canadian peat moss and one-half finely ground pine bark mulch. They say that if you keep doing this, your beds should last 7 to 10 years before having to be totally rebuilt. Well, a better plan is to add 2-3” of compost each year along with a heavy sprinkling of earthworm castings and lava sand. The idea is to both replace the annually decaying organic matter and to keep the nutrients available to feed the plants. Just as the forest floor does, we gardeners need to replace what is used up each year. Compost is a better choice than peat moss and bark because compost is alive with microbes and even has nutrients. Placing shredded cedar on top is an excellent finishing touch.